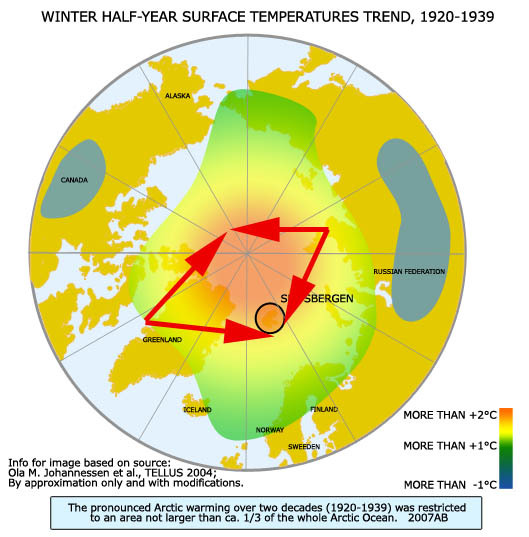 Did the previous Arctic warming start in 1910 or in 1919? 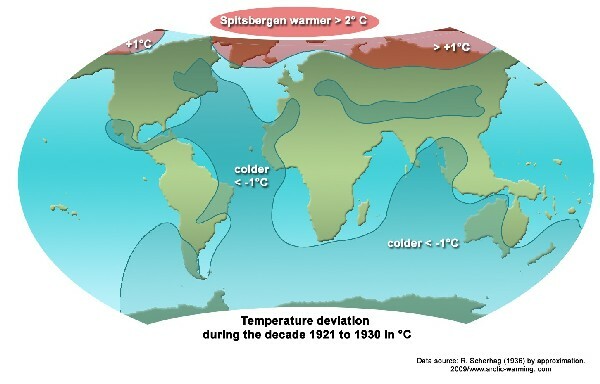 This entry was posted in Climate Cycles, Opinion and tagged Arctic, Natural Cycle, Temperatures. Bookmark the permalink. 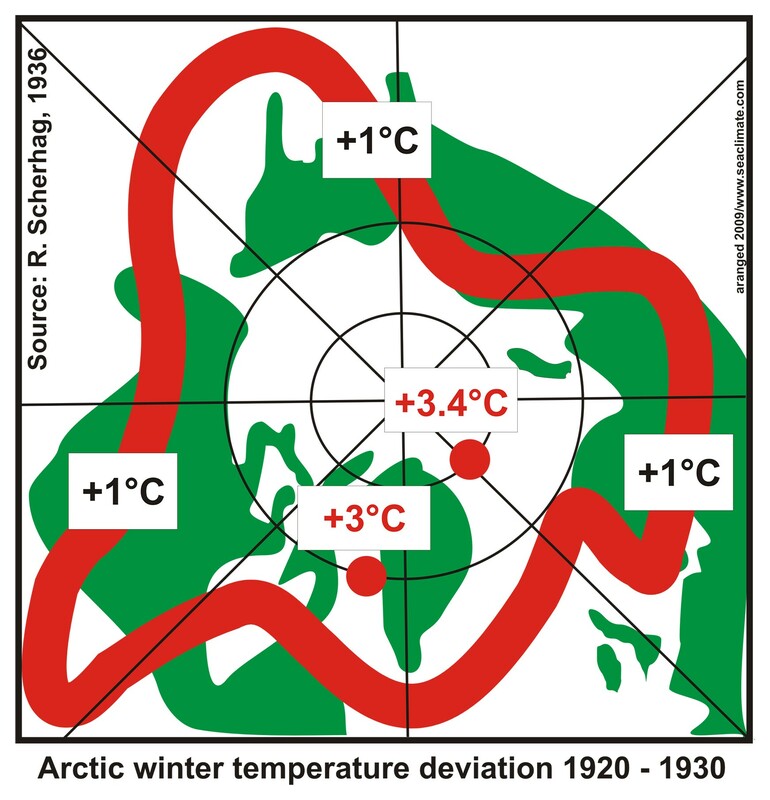 6 Responses to Did the previous Arctic warming start in 1910 or in 1919? Another very nice post. 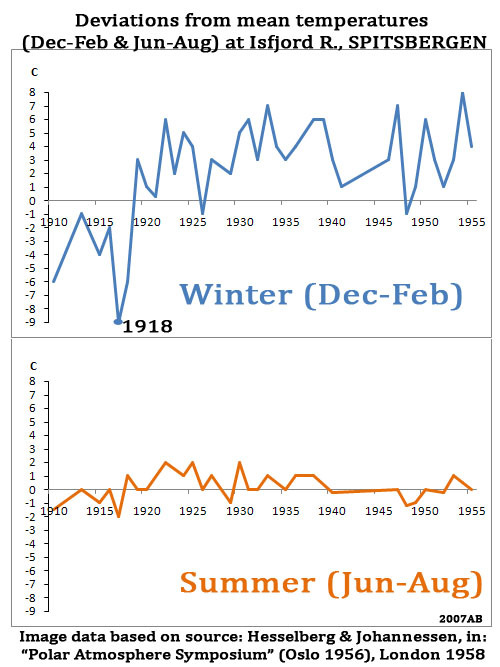 I’d agree with you about the start date of the previous warming being 1918/19. By 1922 it had become so noticeable that even the MSM were commenting on it by way of newspapers and Pathe News reel film. Look forward to your discussion of Causation III. They were also burning an awful lot of oil, not just for transport or manufacturing, but directly into the air in order to move fog away from airfields (with which GS Callendar no less was involved) That must have released an awful lot of Co2 but where it went and what it did I don’t know. In my post above the burning of oil was of course a reference to the second world war practices (which must have had an effect on climate then) but was just meant as an indicator that it was being used for all sorts of uses in vast quantities. During both wars oil was commonly poured by the Navy onto the seas around the coasts in order to smooth the wqaves for military exercises and often set fire to as a practice for possible offensive or defensive use. So much oil and coal being expended in both wars must have had some effect somewhere! Many thanks for your interest, and that you can agree with the timing 1918/19. Why is the research of leading Arctic scientists so unspecific in this respect, as i.e. 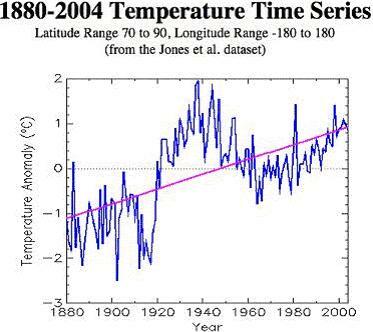 Drinkwater, 2006; Bengtsson, 2004, Johannessen, 2004) name the “1920s and 1930s”, and the IPCC Report 2007 mention the time from 1925 to 1945, usually claiming that the warming was due to “natural variability”. Discussing the “Causation III” is on offer and possible at any time in a not to distant future. 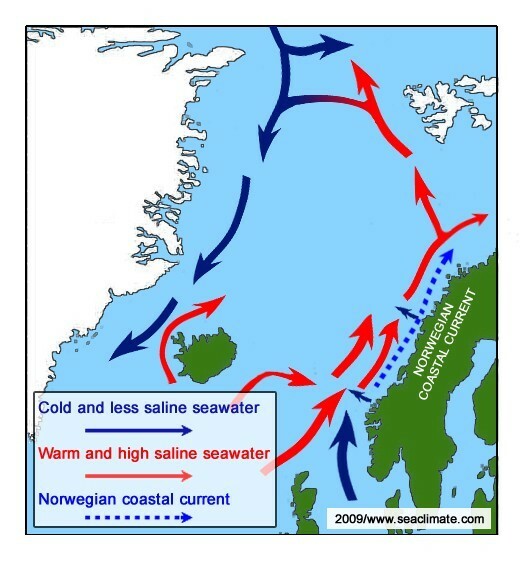 But please be not to surprised if I would abstain in discussing the impact of marine pollution, as I try to restrict my fact presentation and consideration on winter season at higher latitude, and the impact that naval war may have on the sea water temperature and salinity structure over a considerable depth. If that is reflected in, for example, short or longer lasting air temperatures changes, then human activities contributed. This can, I am convinced, be proven with regard to the three European war winters 1939 –1942, but the WWI period has also a lot of interesting aspects. I don’t know why they get the timing wrong as its well documented that by 1922 it had been happening for some years. “The Arctic ocean is warming up, icebergs are growing scarcer and in some places the seals are finding the water too hot, according to a report to the Commerce Department yesterday from Consul Ifft, at Bergen, Norway. Reports from fishermen, seal hunters and explorers, he declared, all point to a radical change in climate conditions and hitherto unheard-of temperatures in the Arctic zone. Exploration expeditions report that scarcely any ice has been met with as far north as 81 degrees 29 minutes. Soundings to a depth of 3,100 meters showed the gulf stream still very warm. The source report of the Washington Post article on changes in the arctic has been found in the Monthly Weather Review for November 1922. 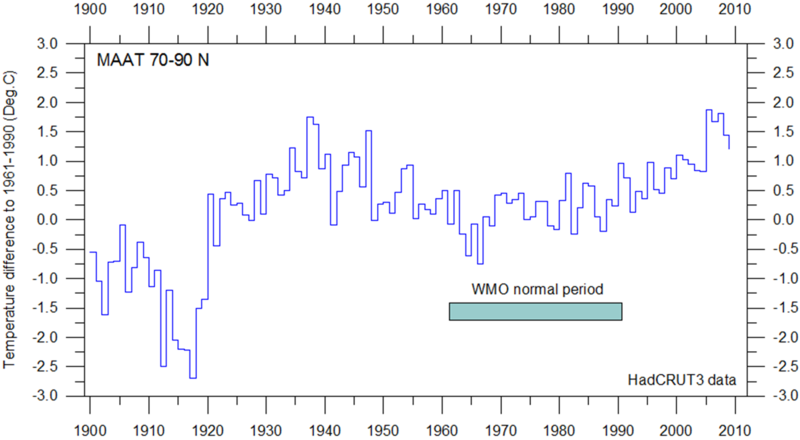 That article also lists a number of other warming episodes. The source is: Birkeland, B.J. 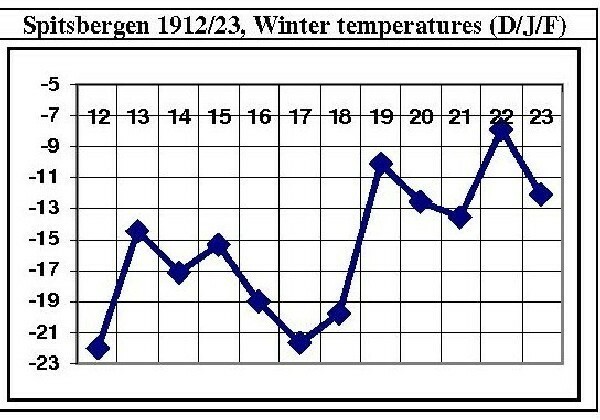 ; ‘Temperaturvariationen auf Spitzbergen’, Meteorologische Zeitschrift, Juni 1930, p. 234-236.